Hurricane Irene punishes east coast of U.S.
Hurricane Irene is drenching the mid-Atlantic states on its way to New England. The National Hurricane Center says Hurricane Irene's sustained winds were topping out at 80 mph while the storm was moving north-northeast at a 17 mph clip. Irene will be moving over cooler waters but is still expected to stay a hurricane until landfall again near Long Island, N.Y., about midday Sunday. Hurricane warnings extend north to Nantucket, Mass. A tropical storm warning extends all the way to the south coast of Nova Scotia, Canada. The storm has knocked out power to at least 2 million customers from North Carolina to New Jersey. Although it is weakening, the storm is still dangerous. 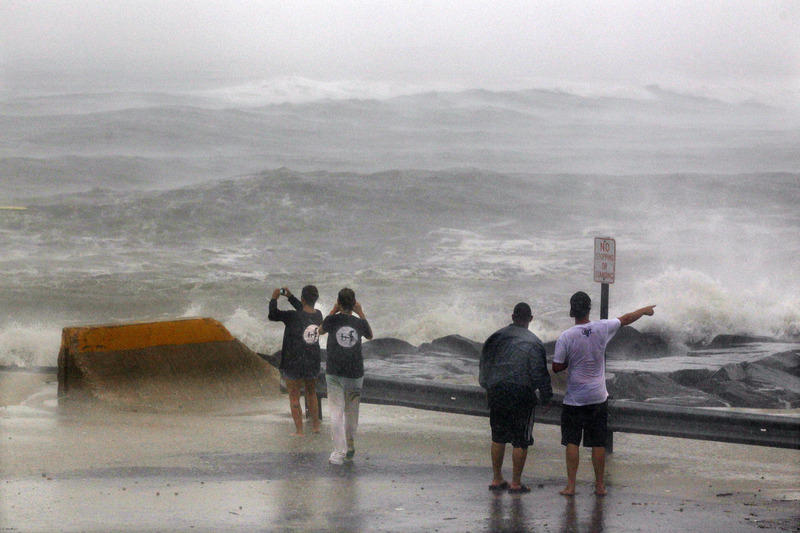 Thus far, Irene has shut down New York and menaced other cities more accustomed to snowstorms than tropical storms as it steamed up the East Coast, unloading a foot of rain on North Carolina and Virginia. New York emptied its streets and subways and waited with an eerie quiet. Washington braced for the onslaught, too, as did Philadelphia, the New Jersey shore and the Boston metropolitan area. Packing wind gusts of 115 mph, the hurricane had an enormous wingspan -- 500 miles -- and threatened a swath of the nation inhabited by 65 million people. As of 10:30 p.m. ET, the eye of the massive storm was about 35 miles northeast of Virginia Beach, Va., moving north-northeast at about 16 mph. Earlier, it had been moving at about 13 mph, but the storm passed back over warmer water, strengthening it. CBS News meteorologist David Bernard reported earlier that Irene could gain strength again as it moves out over warmer Atlantic waters. It is expected to make a second landfall on Long Island sometime Sunday. CBS News correspondent Bigad Shaban reports that officials in Ventnor, New Jersey, are worried about the storm surge that will follow Irene. The many who did not leave along the Jersey Shore could become trapped by the rising water. By afternoon, the storm had weakened to sustained winds of 80 mph, down from 100 mph on Friday. That made it a Category 1, the least threatening on a 1-to-5 scale, and barely stronger than a tropical storm. The deaths blamed on Irene included two children, an 11-year-old boy in Virginia killed when a tree crashed through his roof and a North Carolina child who died in a crash at an intersection where traffic lights were out. Four other people were killed by falling trees or tree limbs - two in separate Virginia incidents, one in North Carolina and one in Maryland. A surfer and another beachgoer in Florida were killed in heavy waves. New York has seen only a handful of hurricanes in the past 200 years. The Northeast is much more used to snowstorms -- including the blizzard last December, when Bloomberg was criticized for a slow response.